Free download Urdu Dictionary for Android with APK file. Download Urdu Dictionary new version from the direct link. 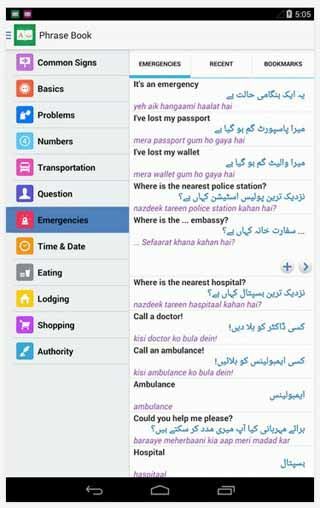 Bilingual dictionary translate words and phrases from English to Urdu and vice versa. Over 56,000 English and 44,000 Urdu words in an offline dictionary, with pronunciation. Includes word learning features and vocabulary training games. Designed for students, professionals and travelers using any android devices. It will automatically optimize itself for both tablet and phone displays to ensure text is easy to read. Users can customize the font for both languages to ensure the text is readable. Definitions include Wiktionary word information, including historical uses of the word and synonyms to help students find the most appropriate word for any sentence. Users can copy and paste translations into any other app or send the translation directly by SMS text message—plus the translation can be sent to Twitter as a tweet, Facebook as a status update, or LinkedIn as a network update. The optional Word Of The Day uses a notification to send students a random most useful English word and definition to help the student expand his or her vocabulary. Flash card, boost memory, multiple choice, and word guess games test students on their existing vocabulary and help them quickly learn new words. Additional online games and feedback encourage study and pits students against each other online to see who has learned the most. Achievements and Leader board track the most advanced users, rewarding students for effective study.